Our first tour took us 140 miles north of Grand Rapids to Williamsburg, MI, near Traverse City. There, we were greeted by the largest of the three individual farms we would visit: MI Local Hops. We were met at the farm by manager Mike Moran, who quickly showed us around the fields of Cascade bines that would end up in Harvest Ale. Their annual harvest begins as early as late August and finishes in mid-September. 2018 marked the third fall harvest for the farm, housed on a former golf course amid 220 acres of rolling hills. Our outdoor tour was cut short by a sweeping rainstorm, typical for an early September in Northern Michigan. And while it’s expected weather, Moran was quick to remind us that these rainstorms can severely halt production. “You can’t harvest wet bines. It can really slow our process for the day.” Once inside, we took in the expansive 30,000SF facility, where their team was hard at work processing the day’s not-rained-on pick. MI Local manages to go from field to cold storage in less than 24 hours–an arduous task but essential in avoiding spoilage and ensuring hop freshness. While nearly all of their hops end up as pelletized product, quality, as well as shelf life of up to two years, is still paramount. Pelletizing also allows the farm to blend up to 15 different yards worth of hops to acquire specific analytics. MI Local’s expansive 220 acres housed on a former golf course in Northern Michigan. Rows of Cascade hops sit awaiting their harvest. Overcoming the reputation of Michigan hops was maybe the hardest challenge. And separating yourself as a farm from other farms—establishing your own brand and differentiating yourselves. 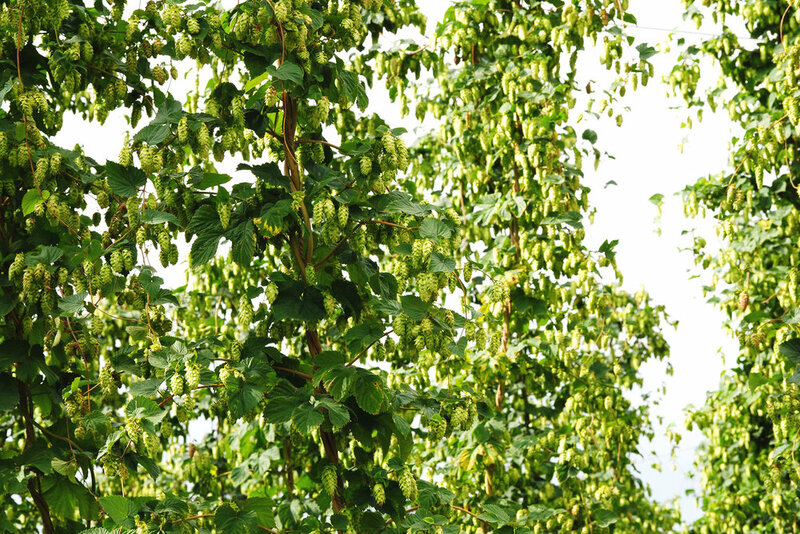 Remnants of leaves and vines are collected as part of the hop cone processing. Founders’ founder Dave Engbers & Brewmaster Jeremy Kosmicki examine the Cascades at MI Local. MI Local’s Mike Moran explains the process of fall harvest and processing. Michigan needs the most honest feedback we can get. It’s one thing to support local and buy local, but we really need to prove our quality. And we strive to do that here. 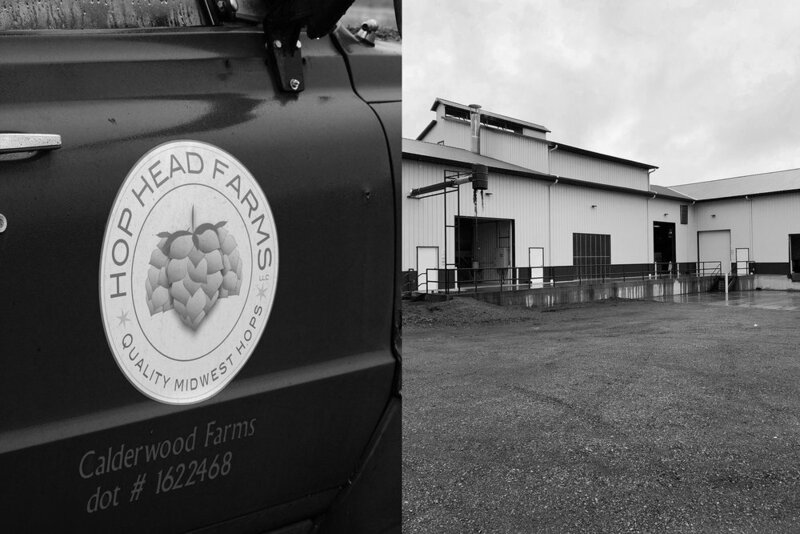 Our next stop landed us 240 miles south from MI Local to the small town of Baroda, MI and Hop Head Farms–the longest tenured operation of our tour, having opened in 2011. Baroda is just one of Hop Head’s handful of acreage and facilities. Here, Crystal is king, as the former Concord grape vineyard now only grows the single hop variety. The farm’s other yards grow several other varietals, however. With the rain calming to just a slight misting at this point, we were shown the grounds by Hopyard Manager, Matt Gura, as their seventh harvest season was well underway. 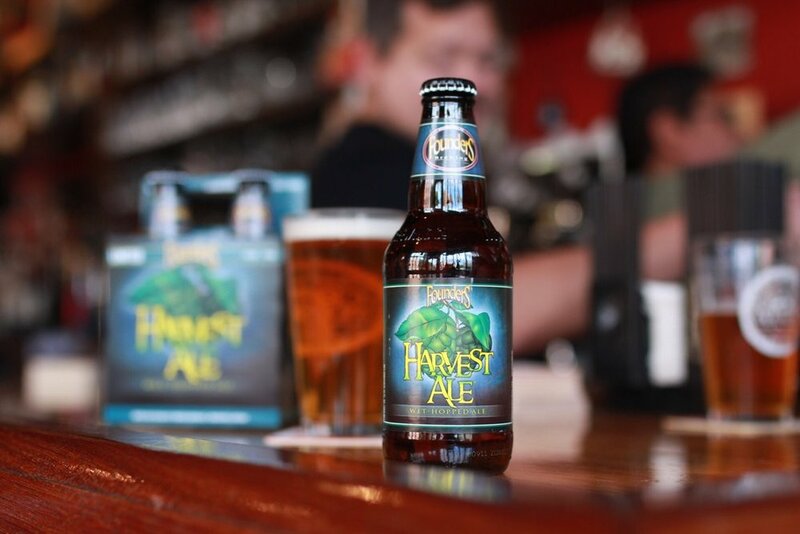 Gura quickly exhibited a mastery of the farming and processing at the farm, and was excited to provide Crystal hops for this year’s Harvest Ale–their first time supplying to Founders Brewing. 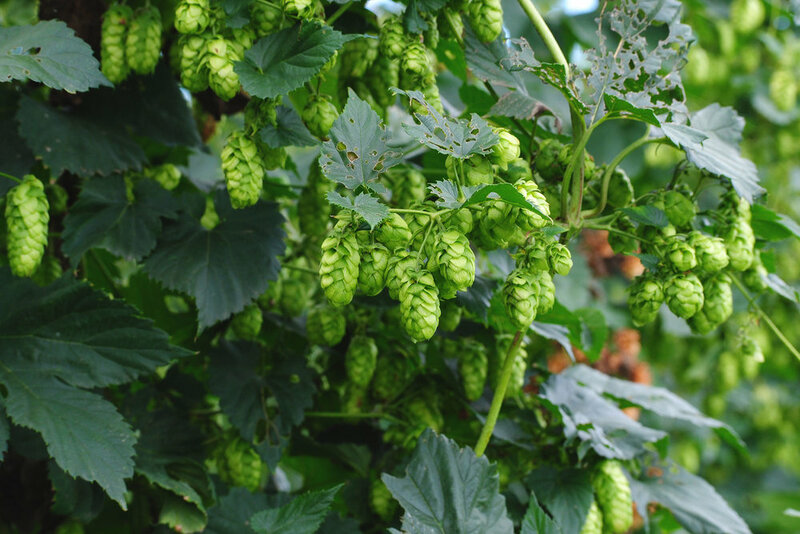 And while the wet-hopped ale doesn’t call for kiln-dried hops, Gura made sure to point out what he considers the most critical part of the hop processing: drying. And as dry and toasty as it was inside Hop Head’s processing facility, the fall drizzle outside quickly reminded us the reason we came: in anticipation of the wet-hopped Harvest Ale, that would soon be showcasing some of these Crystal hops plucked from the bine in Baroda, Michigan. So, we moved on to our last stop, Pure Mitten Hops, and one step closer to witnessing the culmination of this fall IPA’s journey. Hopyard Manager Matt Gura performs a Crystal hop rub. You can work perfectly from march til September, but you can lose a whole harvest once it reaches the kiln. That drying portion is the most important part. Gura examines dried Crystal hops, prior to bailing and shipping. When I first started going to harvest, the industry standard dry temp was 150°F, but as the demand for oils and aromatics has gone up, we’ve seen that final dry temp go down to 125°. It’s been interesting to see how trends drive process. The final stop on our harvest trek took us just down the road to small Coopersville, MI where we would witness the most hand-executed techniques of all three farms. Here, Pure Mitten Hops, which was planted in 2014, was wrapping up its fourth harvest. On this modest 11 acres, the family-run operation was hard at work closing out a week full of overtime, with it’s Cascade harvest. Pure Mitten began with maybe the unlikeliest of scenarios–Morrie and Mary Dieleman, along with their son and daughter-in-law, Justin and Mandy began planning a hop yard as a retirement investment with their family. With no prior farming experience, the clan left their social work and painting careers and dove deeply into researching and strategizing, as well as recruiting several other family members and friends, including Jason Camp who would prove a critical role in the process. Camp’s handy efforts assisted with layout of the yards and facilities–from positioning poles and wires to acting as mechanic on the processing equipment. With four years now under their belt, Pure Mitten has gotten into their groove, even if their harvesting techniques are a tad old school. Here in Coopersville, you won’t find massive automated combines or thousands of square feet of indoor storage. Rather, the bines are harvested by hand, one-by-one, in a painstaking three-man operation. Camp drives a trailer which pulls a flatbed with a wooden tower resembling a lifeguard stand attached. Meanwhile, Justin Dieleman uses sheers to trim each bine from the overhead rope and wire system, as a third set of hands pulls the removed hops and quickly lays them in piles on the flatbed. Once full, they’re transferred onto a separate trailer and quickly driven back to be fed into the separator where the hop cones are pulled from the vines and leaves. If all of that didn’t sound tiresome enough, the process of of getting the cones from the harvest is a separate hand-done task all its own. While the separating machine does a good deal of the work, what is left traveling up the belt into the facility still needs to have soem leaf and vine remnants removed by hand, before making its way into a drying rack–where it is raked and prepped for the kiln (again, the Cascade used for Harvest Ale skip the kiln drying in order to be used for wet-hopping). 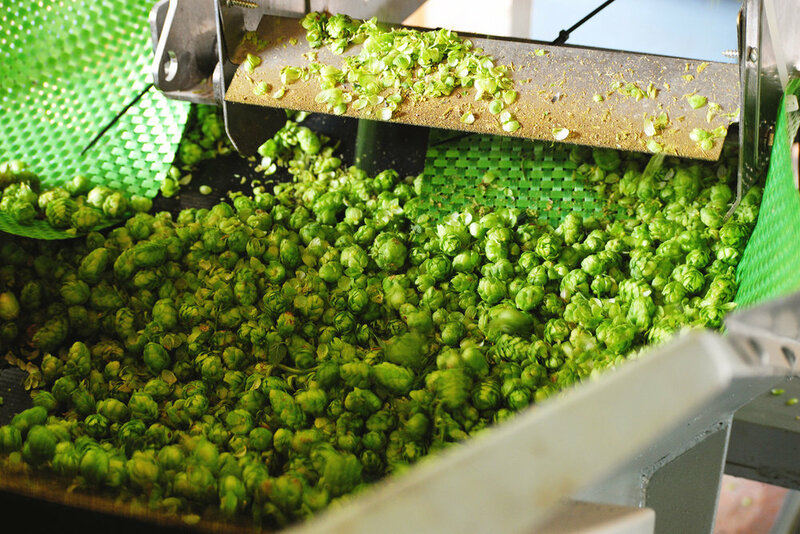 Once air or kiln-dried to their ideal temp, the hops are raked into a separate machine where they rise up a conveyer and into a bailing machine. “We’ve learned it always takes longer than expected. One thing with farming: something always breaks,” said Justin Dieleman. Whew. Needless to say, while a much more quaint farm than the previous two, Pure Mitten is no less impressive. And the Dielemans are showing just why and how the Michigan hop industry is buzzing. They use Cascade from their 1.5 acre yard’s worth into Founders’ fall ale is something they are proud to supply–as one of the country’s smaller hop farms provides one of the country’s largest breweries… “We’re really thrilled to have some of our Cascade in this year’s Harvest Ale. It’s an exciting inclusion for us,” quipped Justin. And we’re sure the efforts won’t go unnoticed. Founders’ R&D Brewer, ‘Diamond’ Deschaine, examines some Mackinac hops off the bine. We’ve learned it always takes longer than expected. One thing with farming: something always breaks. Pure Mitten’s Justin Dieleman feeds hop bines into the hop separator. The result of these three farm’s harvest and toiling work is Founders Brewing Co.’s 2018 Harvest Ale, a juicy, wet-hopped, Cascade and Crystal, super fresh fall IPA. The beauty in a wet-hopped ale is it’s undeniable aromatic heft. It’s packed full of pine and melon aromas and drinks just as it sounds. 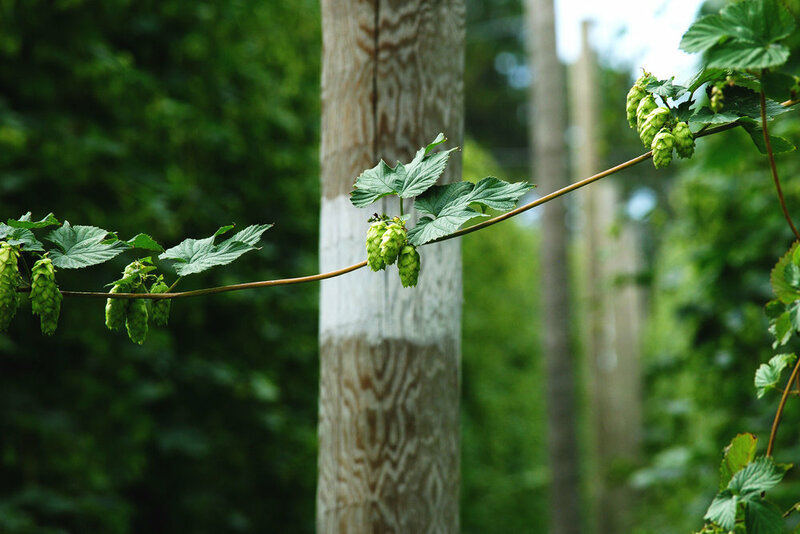 To guarantee freshness, the brewing team works around the clock to transform the fresh hop cones into Harvest Ale. According to Brewmaster, Jeremy Kosmicki, “it is an arduous, tiring process,” but there are few beers he enjoys brewing more. Harvest Ale marks the return of fall, and the hands-on production process transforms the brewery into an aromatic, greenhouse-like space that is unique to this season. Harvest Ale is available nationally in bottles through October 2018 and is available in 4-packs of 12oz bottles and on draft across the brewery’s distribution footprint (like Chicago’s Map Room). It is an arduous, tiring process, but there are few beers I enjoy brewing more. Harvest photography by Jack Muldowney. Packaging photography by Lakeshore Beverage.